Butter by Erin Jade Lange. Audience/Genre : Young Adult/Contemporary, Drama. Publication : September 18th 2012 by Bloomsbury. A lonely obese boy everyone calls "Butter" is about to make history. He is going to eat himself to death—live on the Internet—and everyone is invited to watch. When he first makes the announcement online to his classmates, Butter expects pity, insults, and possibly sheer indifference. What he gets are morbid cheerleaders rallying around his deadly plan. Yet as their dark encouragement grows, it begins to feel a lot like popularity. And that feels good. But what happens when Butter reaches his suicide deadline? Can he live with the fallout if he doesn’t go through with his plans? With a deft hand, E.J. Lange allows readers to identify with both the bullies and the bullied in this all-consuming look at one teen’s battle with himself. JP/Butter is an obese boy in high school with a love for the saxophone and quite obviously, food. Butter's high school life involves him pretty much being ignored by everyone as he's way past the weight to be bullied as the fat kid; most of his classmates just feel sorry for him now. He's also crushing on a girl from his school called Anna, but she'd never talk to him if she knew who he really was so he uses fake online identity called JP, claiming to be a boy from a nearby high school, and gets into an online relationship with her. I've mixed feelings about this book. As soon as I read the blurb, I wanted to get my hands on Butter. 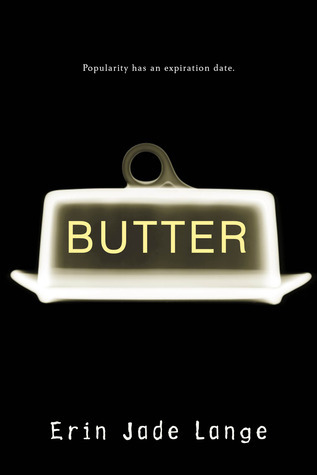 I expected a powerful, emotional novel and I'll admit, the writing's actually pretty good but sadly, the protagonist, Butter, pissed me off. I'm not sure how I can love a book when I don't like the main guy in it. Being overweight is a painful, mind-f**king ride for an obese person, or so I'd think but Butter's attitude in general was too cocky and arrogant for my taste. I tried to appreciate that he was strong despite being the fat guy who was stared at and mocked but I didn't even feel like he was a good person; his personality disturbed me and that's my main issue with this book. Most of the time, I just couldn't feel sorry for him or even support him. However, setting that aside, I'll say it again, the writing is really good and holds your interest. The author manages to evoke all these emotions in you (trust me, it's going to be different for everyone) and it's obvious Erin has a way with words. A guy claiming to eat himself to death on the internet? That's a pretty unique idea although at first I felt that it wasn't pulled off very realistically..but then again, teenagers are pretty dumb these days so maybe all the sudden popularity that Butter suddenly received from his classmates is understandable. Over all, I would've liked this book more if it took a different direction with Butter's personality but there may be some people who actually like Butter just the way he is.